Induction cooking is becoming a big thing. It’s a safe alternative to gas and electric and you can get great results… if you have the best cookware for induction. If you don’t know where to start, don’t worry! We researched and reviewed some of the best-selling, cutting edge products on the market to help you find a great induction cookware set. Before we get to our cookware reviews, here are some features you should know about. Number of Pieces - This will vary from set to set and boils down to personal preference. Do you want a large set that’s going to give you practically everything you need? Or something smaller and easy to store? Finish Types - Some nonstick surfaces require plastic utensils but there are other options, too. Brushed or mirrored surfaces give you a bit of freedom when it comes to, say, using the dishwasher, while still preventing caked on messes. Gas Ready - We assume you’re looking for induction cookware because you want to use it on an induction cooktop. But it’s nice to know you can use it with gas, too. Especially if you only have one induction burner. Electric Ready - It’s always better when things are versatile, especially when you really invest in something. Being able to use this cookware on both an electric and induction stove makes it a really good investment. Warranty - No warranty is the same so it’s important that you read the fine print. Also, bear in mind that “lifetime warranty” doesn’t mean “we’ll replace it for any reason.” Know where you’re covered. And where you’re not. Here’s the scoop: induction cooking is gaining popularity. It’s a great way to make good food even better. You can eliminate some of the fats and oils you use just to keep things from sticking to the plate. Now that you know more about the important features, let’s take a closer look at our induction cookware reviews. If you’re in a rush, make sure to take a look at our top and budget picks. Now, let’s get cooking. This cookware set from T-fal is one of the best nonstick induction cookware sets around. One reason? It’s so durable and scratch resistant, you can even use metal utensils with it. It comes with the brand’s signature T-fal Thermo-spot heat indicator that lets you know when the pan is preheated to the perfect temperature. Why is this important? It helps seal in the juices, keeping your food moist and delicious. The silicone handles are not only comfortable, they’re resistant to heat. And speaking of heat, these can even handle oven temperatures of up to 400 degrees. 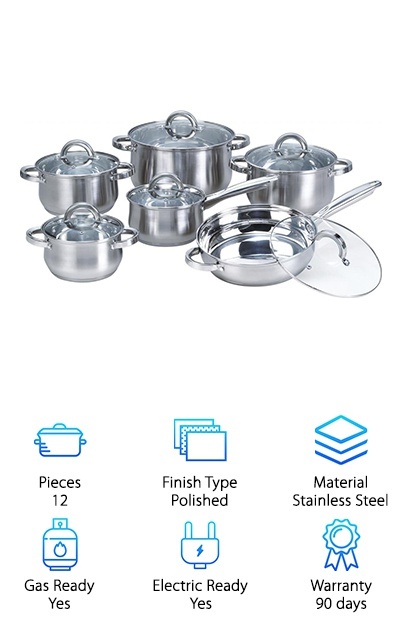 This set includes a nice variety of cookware: large and small frying pan, a 5-quart stock pot with lid, large and small sauce pans with lids, an egg wonder pan, a stainless steel steamer, plus a nylon spoon and spatula. 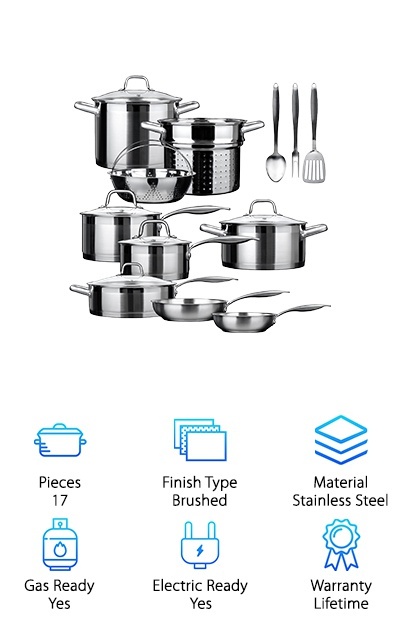 This set from Cook N Home is made of stainless steel, but that’s not all. The encapsulated bottoms contain aluminum. Why does this matter? Aluminum is durable and distribute heat evenly. That means no hot spots and less burned food. 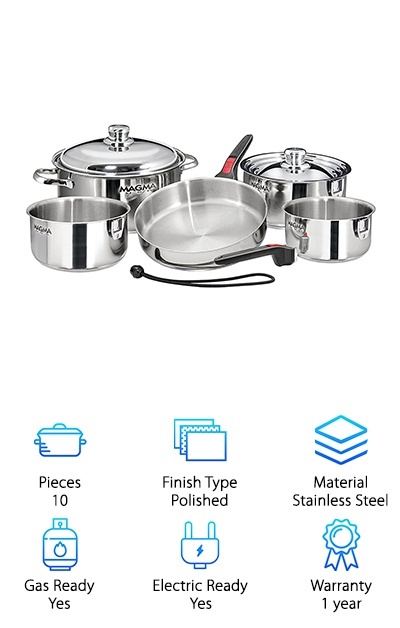 This set includes large and small saucepans with lids, a 3-quart casserole pan with lid, 5 quart stockpot with lid, and a large frypan with lid. The mirror polish finish makes these pots and pans look shiny and elegant, like they belong in a chef’s kitchen. The silicone wrapped handles stay cool to the touch. This set was designed for an induction stovetop but can also be used on electric, gas, or ceramic cooktops. One more thing: clean up’s a breeze, just pop these right in the dishwasher. NuWave is a groundbreaker in induction cooking so it’s no surprise that they made the list of best induction nonstick cookware. This set is a good size, too, as it comes with the basic things you’ll need to get started induction cooking. You get a large frypan, large and small sauce pans with lids, and a 5.5-quart stock pot with lid. They all feature cool-to-the-touch stainless steel handles. The non-stick surface is so effective, you’ll find you can use less butter or oil when you’re cooking. These pots contain aluminum as well as stainless steel. These pans heat evenly so you can get consistent results with your food. Though they’re designed for induction cooking, this cookware can be used on any stovetop. And check this out. They’re safe for the oven, too. Duxtop Induction Cookware is made of whole-clad triple layered stainless steel with an aluminum core. You’re probably picking up on a pattern by now. Aluminum is frequently used as a component in induction pans for good reason. Heat distribution. So, this set will also have an evenly heated cooking surface, even along the sides of the pans. In addition to that, it can handle oven temperatures of up to 500 degrees. 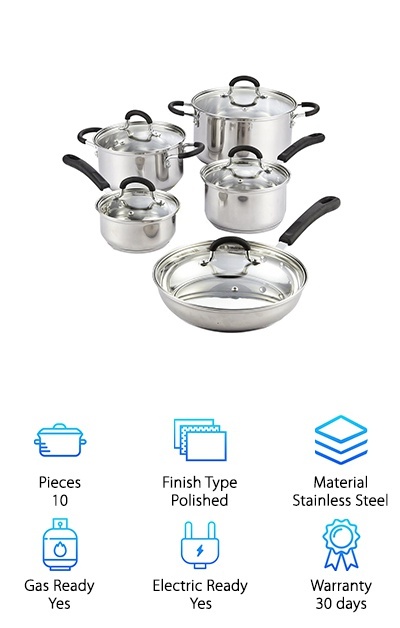 This set includes large and small frypans, large and small sauce pans with lids, and a large saucepot with lid. And check this out: they all have drip-free pouring rims. Oh, and you also get a potholder, though the riveted handles are stainless steel and will stay cool to the touch. Plus, cleanup is easy because these pots and pans are dishwasher safe. Heim uses 3 layer technology that includes a thermal bottom so the surface heats quickly and retains heat. It uses the sides of the cookware as well as the bottom to heat food more efficiently. In this set, you get a large frypan with lid, a saucepan with lid, and 4 different size casserole pots with lids. These will really stand out in your kitchen, too. The brushed stainless steel surface, round lines, and large semi-circle handles give these pots and pans a very distinctive look. The rims are all tapered so you can pour without worrying about making a mess. These are oven safe, plus you can put them in the dishwasher for easy cleanup. They also work with any kind of cooking surface, even though they were designed for induction cooking. For an all-inclusive set that will give you just about everything you need, check out this one from Duxtop. 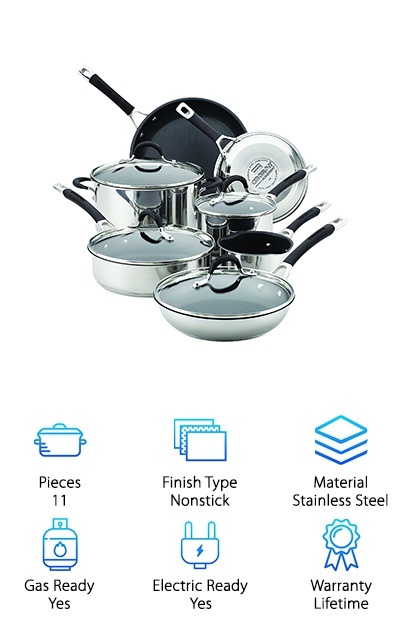 You get a lot here: large and small saucepans with lids, casserole dish with lid, stock pot with lid, large and small frypans with lids, a sauté pan with lid, plus a boiler basket, steam basket, and 3 piece kitchen utensil set. 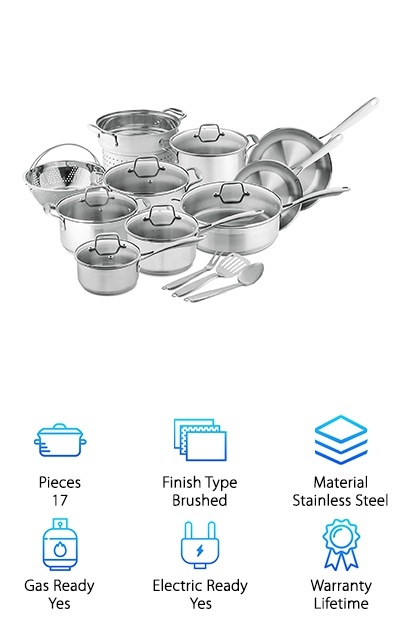 The pots and pans are made of stainless steel and the encapsulated bottom is bonded with 0 you guessed it - aluminum. These are usable on any cooking surface and oven-safe up to 550 degrees. They’re also dishwasher safe and, get this, freezer safe for food storage. The surface is brushed inside and out. They look like what you’d find in a professional’s kitchen. There’s not a lot you can’t do with this set! If you’re looking for the best induction cookware for your RV or if you don’t have a lot of space in your home kitchen, check this out. They nest inside one another and all 10 pieces take up less than ½ cubic foot of space. They’re mainly made of stainless steel, but the encapsulated bottoms include a Tri-Clad material. What’s included? Well, if you guessed aluminum, you’re right. 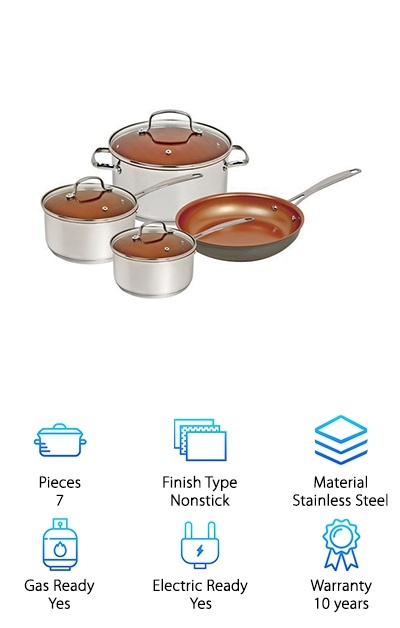 This set includes large sauté pan with lid, 3 different size sauce pans with one multipurpose lid, a large stock pot, removable handles, and a bungee cord to help keep everything together when they’re being stored. All the cookware is oven safe and dishwasher friendly. These are perfect for traveling and, we’re not kidding, barely take up any room at all once they’re put away. 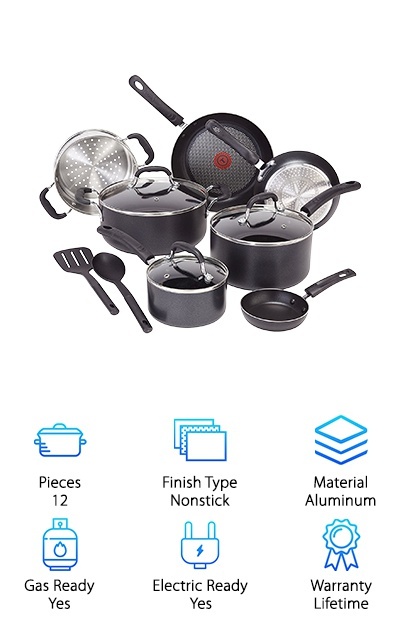 Here’s another great option if you want a large set that will give you just about everything you need as far as cookware goes. You get large and small saucepans with lids, a casserole pan with lid, stock pot with lid, sauté pan with helper and lid, a boiler and a steamer basket, plus a set of 3 kitchen tools. Finished with brushed stainless steel inside and out, this set just looks impressive. Where’s the aluminum? Encapsulated into the bottoms. The ergonomically shaped handles have an anti-slip finish. They’re riveted to the side so they’re sturdy and durable. This is a very versatile set. It’s oven safe up to 550 degrees and can go in the freezer to store any leftovers. Plus, cleanup is a snap because they’re dishwasher safe. The elegant looking cookware is one of the set has a brushed outer finish with a mirror finish on the inside to prevent sticking. The bottoms feature Triple-Ply construction for proper heat conductivity. There’s an amazing metal added that prevents hot spots and helps food cook evenly. (Hint: it’s aluminum.) Heat technology helps control heat even up the sides of this cookware. 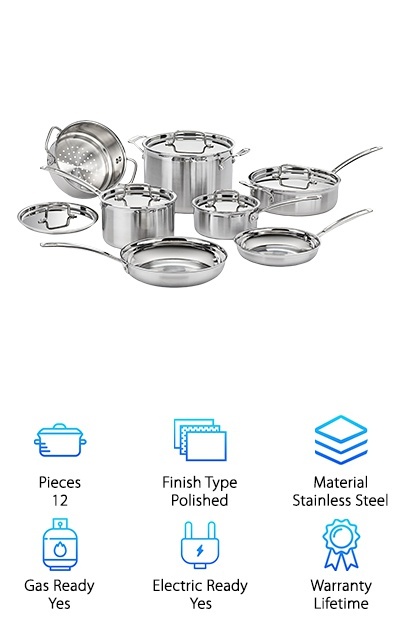 This set include: large and small saucepans with lids, large and small open skillets with lids, a sauté pan, a stockpot with lid, and a steamer insert with lid. They have tapered rims for drip free pouring. That’s not all. They help get a better seal when you put on the lid, helping your food stay moist. Modern-style handles are comfortable to hold and stay cool. They give this cookware a unique look, too. Circulon has some of the best nonstick induction cookware. Why? It’s dishwasher safe and you can use metal utensils with it. Raised circles change the surface area of the pan and allow food to slip right off. And don’t worry, it’s also resistant to scratches, chips, and stains. The magnetic steel base has a core made with (say it with me now) aluminum. And that’s not all. The polished exteriors make this set look like it belongs on a chef’s stove. The handles have silicone grips so you don’t have to worry about them getting hot. You can even put these in the oven at temps up to 400 degrees. 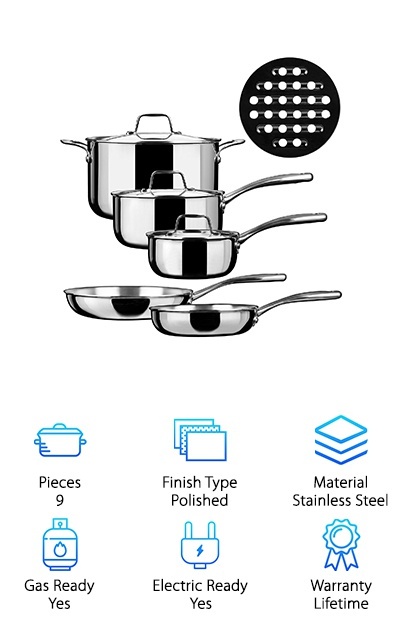 This set comes with large and small saucepans with lids, stockpot with lid, sauté pan with lid, and 3 different size skillets.